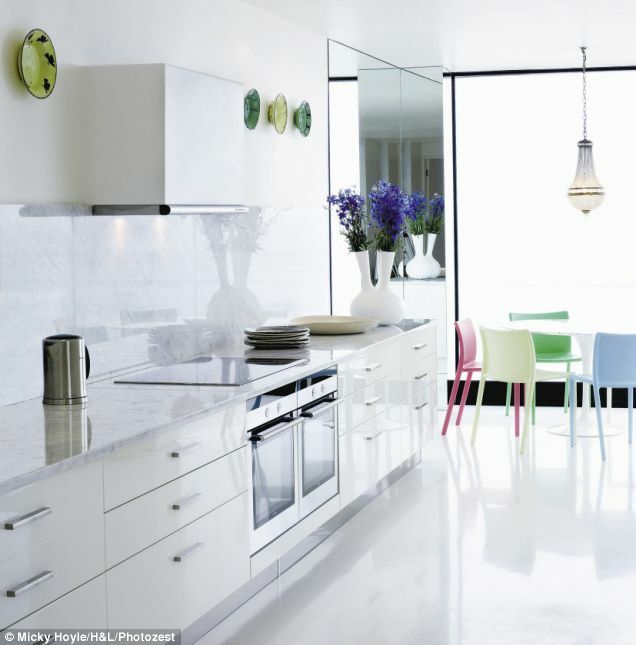 Do you use mirrors in your kitchen? While we are in the midst of a bathroom remodel in our marina condo, we have been without a vanity. Mirrors are placed on the recessed panels of these cupboard doors! Gorgeous. All teeth brushing and face washing and make-up applying, and so on, has moved to the kitchen sink. We simply leaned our vanity mirror behind the kitchen sink. Sitting down so close to the faucet, it was constantly getting splattered, and keeping it clean was turning into a big PAIN. It looked so bright and pretty when it was clean, but it never stayed clean for long..... Well, it occurred to me that we don't actually have to watch ourselves brush our teeth, so I moved the mirror to an adjacent wall -- about twenty inches from the sink -- and I LOVE it! It is far enough from the sink that it does not get splashed, but it reflects light, and makes the space look larger. this could work very well. For a busy mom, it might become a maintenance problem. I decided to look around and see how others are using mirrors in their kitchens. Years ago, we lived in a rental house that had a mirrored back splash behind the stove. Ours was a busy family -- I worked, my husband worked and attended grad school full time, and we had three children under the age of six. The mirrored back splash was a nightmare. Three meals a day were being prepared at that stove, and keeping that mirror clean, on top of diapers, and laundry, and housework, and yard work, and paid work, and homework, was just too much. All these years, I've allowed that experience to cloud my judgment! 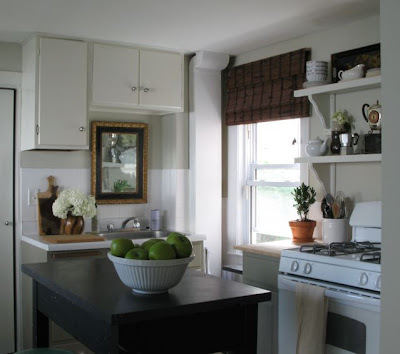 Be sure to check out An Urban Cottage to see lots of remarkable transformations! After the eye opening experience in my condo kitchen, I saw Steve's beautiful kitchen at An Urban Cottage. He has a mirror above his sink, but it is mounted high enough to avoid being splashed -- it should stay just as clean as any vanity mirror mounted several inches above your lavatory. I love that the traditional styling references his home's history, while still being unexpected. And I love that it reflects light and visually enlarges the space. Camille, at The Vintage Object, uses a long framed mirror to support a focal point in her kitchen. It is such a pretty way to style her space! Camille has done a beautiful job styling her entire home, so be sure to check out her blog. In the modern kitchen shown below, mirrors are used to define the dining area in an open concept space. Here is another example of using a traditionally framed mirror above the sink. In this simple streamlined space, the mirror creates a focal point. This tiny mirror might not create too much of a maintenance burden behind the stove -- what do you think? These smokey mirrored tiles might be a little more forgiving than my old back splash. This back splash made. me. swoon. The diamond shaped mirrored tiles, with darker accents at the intersections is just stunning! So tell me, would you use mirrors in your kitchen? I'm definitely scheming about the best way to use a mirror in my kitchen! Thank you for featuring my kitchen and for your kind words about it. It's probably better said than I could have done. The mirror there is surprisingly care free. It does get splashed occasionally but it doesn't require any more cleaning than if it weren't there. When I'm able to save enough money to do a full-scale remodel, I'm planning to do a large mirror on the wall behind the stove. Yes, it will get splashed with grease but mirror seems as easy to clean as just about anything...perhaps even easier than getting grease off grout. I love the diamond-patterned back splash, but our water is so hard that I'd constantly be polishing. I like the idea of a mirror in a kitchen, but perhaps in a frame on a wall opposite a window - I can always use more light! I might use them in an area that wasn't near the stove, sink, or general work area. Mirrors on the backsplash make each object on the counter look like two objects and can translate as clutter. First time that I see mirrors in kitchens! They look nice! would like to say more about it but I'm not sure how to say it in English haha. What a great idea....using mirrors as backsplashes, etc... I really never thought of this, but I can see that it is very stylish! We cook fairly often and I think this might mean more cleaning, but I don't think it would be any more difficult as I polish my stainless appliances everyday. Love it!! !